BALL UP: Junior Francisco Gomez keeps his defender at bay while he prepares to shoot the ball over his Gahr Gladiators defender. With a 9-5 preseason record, varsity boys water polo will kick off league with a game against the Alhambra Moors, Oct. 8. The Spartans took on the Gahr Gladiators on Oct. 9, winning 15-6, at home. The varsity team lost its first game in the Diamond Bar Tournament to Yorba Linda 15-4, but came back with a 16-11 win over El Modena Sept. 26. The Diamond Bar Tournament continued on Sept. 27, and the varsity boys water polo lost 11-10 and 14-13 to Palm Springs and Temecula Valley, respectively. 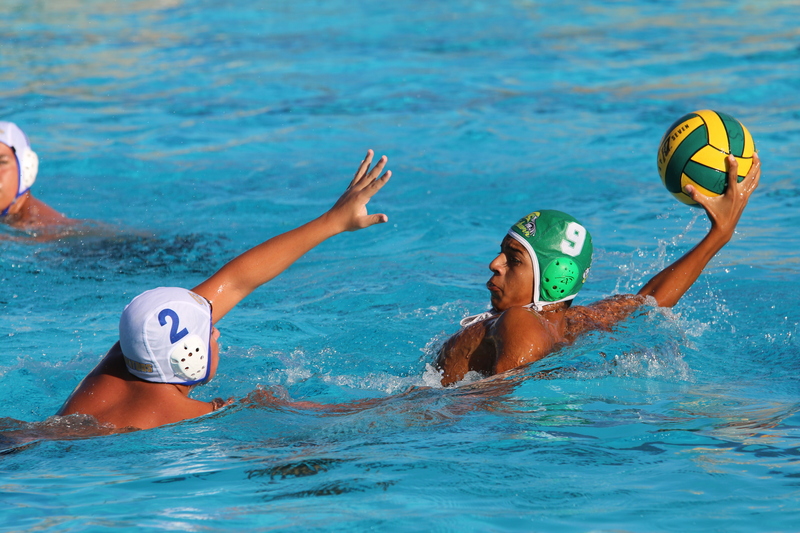 On Sept. 25, varsity boys water polo dominated J. Burroughs High School with a final score of 15-7. The team lost 23-16 against Pasadena High School Sept. 23. “I think we are doing well this year, but we should always work and fight harder,” said Jared Oyola, varsity goalie. The JV boys won, 11-5, against J. Burroughs High School Sept. 25 and beat Pasadena, 9-6, Sept. 23. “I think we are doing pretty well. We just need to work on communicating more and working in unison,” said Diego Jones, junior JV water polo player.